This year's Northeast Astronomy Forum will include several talks about the Apollo program. Space fans will gather this weekend in Suffern, New York, to celebrate astronomy at the Northeast Astronomy Forum — and if you'll be attending, be sure to stop by Space.com. The Rockland Astronomy Club has been holding the annual event for nearly three decades at SUNY Rockland Community College in southern New York. This year's gathering will be held April 6 and 7. On April 6, speakers will include astrophotographer Chris Go, NASA chief scientist Jim Green and NASA astronaut Don Pettit. 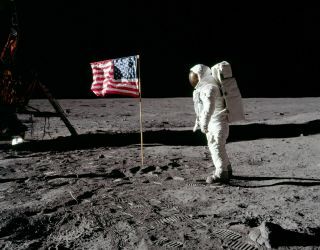 In addition, Kevin Schindler, the historian at Lowell Observatory in Arizona, will speak about the facility's participation in the Apollo program; and Bill Ayrey of ILC Dover, which built the Apollo 11 suits, will discuss spacesuits through the ages. On April 7, Alan Stern, the principal investigator of the New Horizons mission, will speak about the spacecraft's recent flyby of a Kuiper Belt object, then Dylan O'Donnell of telescope company Celestron will offer "A Tour of the Southern Skies." The event will wrap up with talks from Neil Armstrong biographer James Hansen and Apollo 7 astronaut Walt Cunningham. The event will also include giveaways and a children's corner with activities for kids. If you stop by, look for Space.com in the exhibition hall, which will be open both days. We'll have stickers, posters and more for visitors, with managing editor Tariq Malik on hand to talk space with visitors! Tickets are available in advance online or that day at the door.